Seated Statue of Hatshepsut, ca. 1479–1458 B.C. Hatshepsut, the most successful of several female rulers of ancient Egypt, declared herself king sometime between years 2 and 7 of the reign of her stepson and nephew, Thutmose III. She adopted the full titulary of a pharaoh, including the throne name Maatkare, which is the name most frequently found on her monuments. Her throne name and her personal name, Hatshepsut, are both written inside oval cartouches making them easy to recognize. In this life-size statue, Hatshepsut is shown wearing the nemes-headcloth and the shendyt-kilt. These are part of the ceremonial attire of the Egyptian king, which was traditionally a man's role. 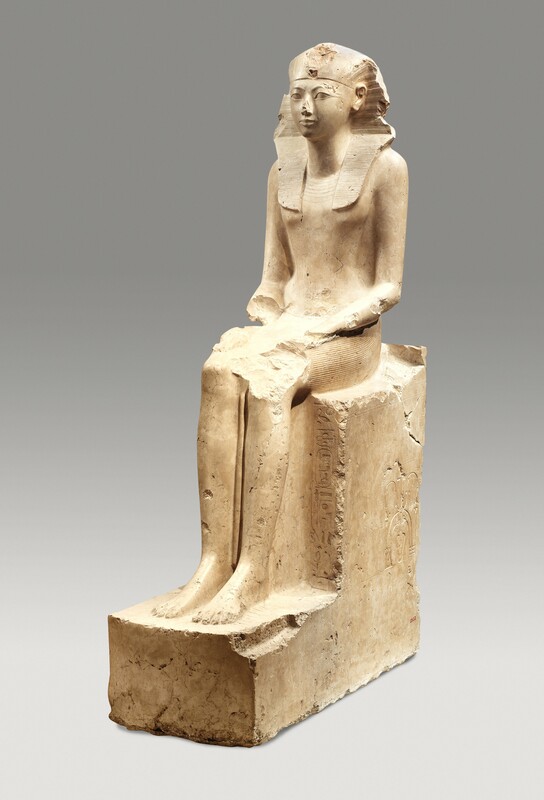 In spite of the masculine dress, the statue has a distinctly feminine air, unlike most representations of Hatshepsut as ruler (see, for example, three over life-size statues that represent her seated (27.3.163), kneeling (30.3.1), and standing (28.3.18)). The kingly titles on the sides of the throne are feminized to read "the Perfect Goddess, Lady of the Two Lands" and "Bodily Daughter of Re," a practice that was dropped later in her reign. Traces of blue pigment are visible in some of the hieroglyphs on the front of the statue and a small fragment on the back of the head (see attached photograph) shows that the pleats of the nemes-headcloth were originally painted with alternating blue and yellow pigments. For Audio Guide tours and information, visit metmuseum.org/audioguide. The lower part of the statue was acquired by Karl Richard Lepsius and taken to Berlin in 1845. The head, left forearm, and parts of the throne were excavated by the Museum during the 1926-27 season and acquired in the division of finds. The Berlin fragment was acquired by exchange in 1929. Williams, Caroline Ransom 1930. MMS (Metropolitan Museum Studies). III(1930-1931), Pt. 1, 84, footnote 12. Breasted, James H. Jr. 1936. Geschichte Ägyptens. Zürich, 110. Winlock, Herbert E. 1937. Egyptian Statues and Statuettes. New York, fig. 10. Scott, Nora E. 1945. Egyptian Statues. New York: The Metropolitan Museum of Art, cover. Vandier, Jacques 1958. Manuel d'archéologie égyptienne, 3. Paris, 300-301, pl. 47. Hayes, William C. 1959. Scepter of Egypt II: A Background for the Study of the Egyptian Antiquities in the Metropolitan Museum of Art: The Hyksos Period and the New Kingdom (1675-1080 B.C.). Cambridge, Mass. : The Metropolitan Museum of Art, p. 99. Glubok, Shirley 1962. The Art of Ancient Egypt. New York: Atheneum, p. 18. Arnold, Dieter, Emma Brunner Traut, Henry G. Fischer, Matthias Seidel, Wilfried Seipel, C. Vandersleyen, and Erika Feucht 1975. Das alte Ägypten, Propyläen Kunstgeschichte, 15. Berlin, p. 244, fig. 174. Aldred, Cyril 1980. Egyptian Art in the Days of the Pharaohs, 3100-320 BC, World of Art, New York: Oxford University Press, p. 154, no. 114. Hibbard, Howard 1980. The Metropolitan Museum of Art. New York: Harper & Row, 34, 35, fig. 52, 54. Dorman, Peter F., Prudence Harper, and Holly Pittman 1987. Egypt and the Ancient Near East in The Metropolitan Museum of Art. New York: The Metropolitan Museum of Art, pp. 44-46. Dodson, Aidan M. The Complete Royal Families of Ancient Egypt. 2004. London: Thames & Hudson, Pp. 132. Artist: Date: ca. 1479–1458 B.C.